Currently, cells are routinely cultured in vitro using 2 dimensional (2D) cell culture techniques. It has been well documented that cell culture in tissue culture plates and flasks does not mimic the in vivo cell growth. Therefore, the cell expansion and cell-drug interactions under 2D are not appropriate in vitro models. 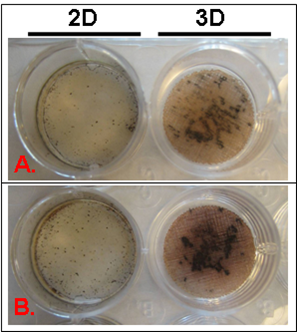 3D cell culture technique, on the other hand, offers a better cell culture environment because it is one step closer to the in vivo cell growth environment. However, because 2D culture is easy to carry out and there are no satisfactory 3D cell culture devices available, 2D cell culture is still the predominately used cell culture technique. As a publication in the journal Nature pointed out, “Awareness of the potential of 3D tissue culture among scientists is far too low. But the benefits of the technique are so self-evident that little marketing will be needed to persuade the uninitiated to move up one dimension, just as soon as the issues of convenience are resolved” [Nature, Vol. 424, 21, August 2003]. Having realized the importance of conducting cell culture under 3D, 3D Biotek has been working on developing easy to use 3D cell culture devices. The initial application of these 3D cell culture devices will be primarily in the stem cell research, tissue engineering, and drug discovery and will expand to other cell culture related fields gradually.